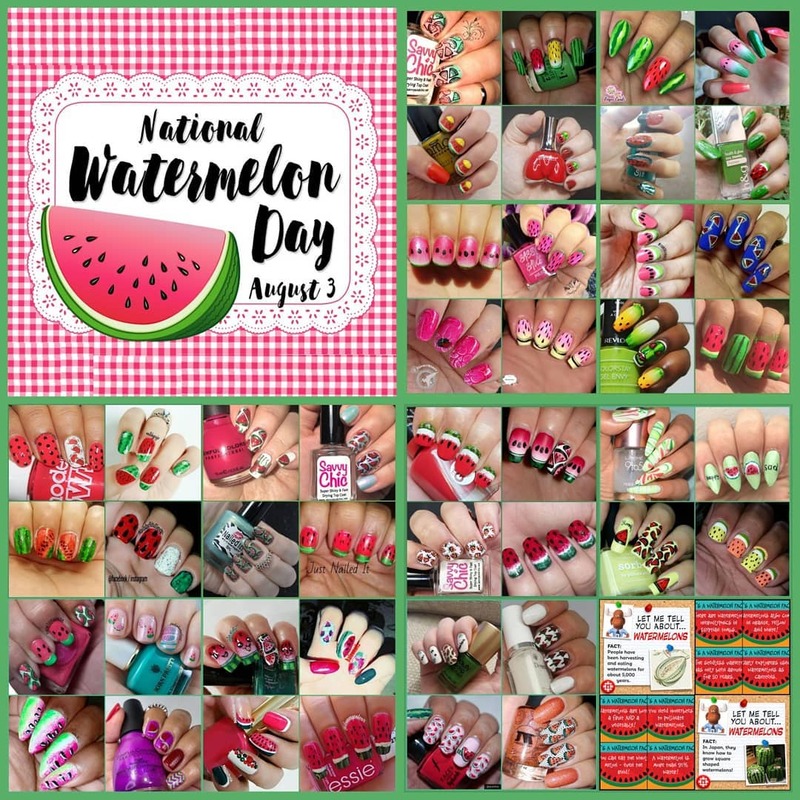 It’s International Watermelon Day and Tena (@nailsit) put together a collaboration to celebrate. 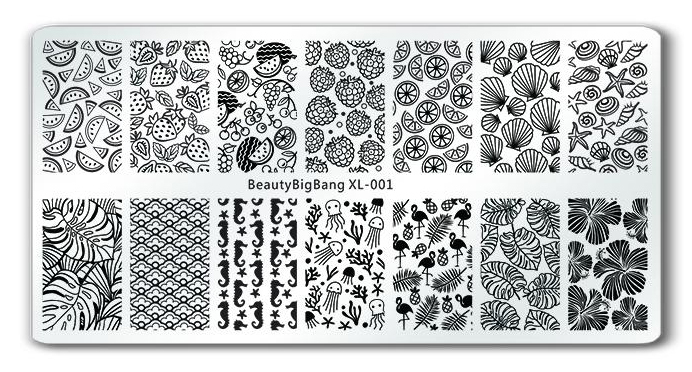 I thought it was the perfect time to review Beauty BigBangs’ XL-001 stamping plate since 2 of the 14 images have watermelons on them. If you’ve been reading me for long, you would know my enthusiasm for stamping plates with food and this one also has some adorable jellyfish as well. Sold! Unlike Beauty BigBang’s square plates, the rectangular plates have a white plastic backing. The etching quality is great as I’ve come to expect from Beauty BigBang. 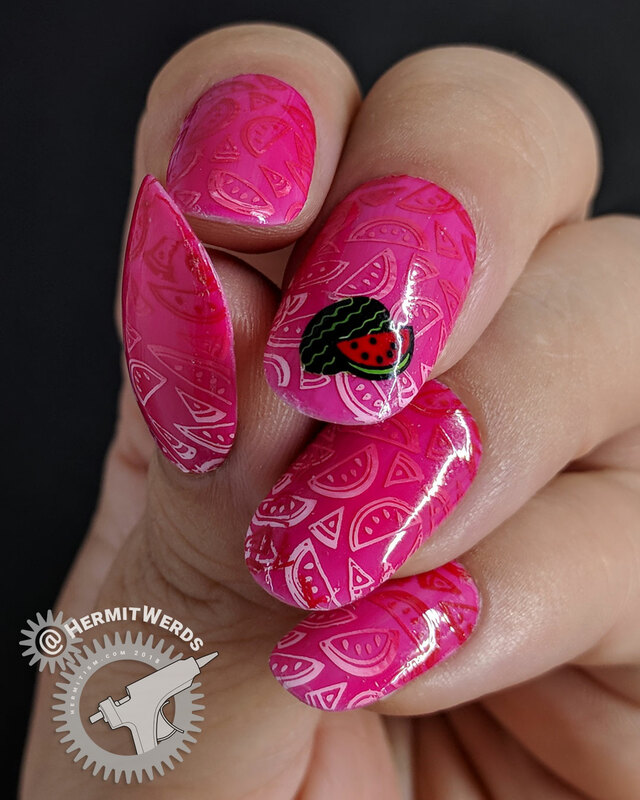 They aren’t super deep or shallow so they will work well with both super thick stamping polishes like Mundo de Unas and lighter ones like Bundle Monster’s. I am sad to say, however, that the width of the images is 2mm smaller than their square stamping plates so I was forced to streeetch the full nail image on my thumb a tiny bit. This should not be a problem if you have narrower nails than mine. My thumbnail is about 16mm wide and the false nails I’m using right now are even wider than that at 20mm. Jellyfish. Background is a gradient of Bee’s Knees Lacquer’s “House on Haunted Chill” and “Na Cl”. 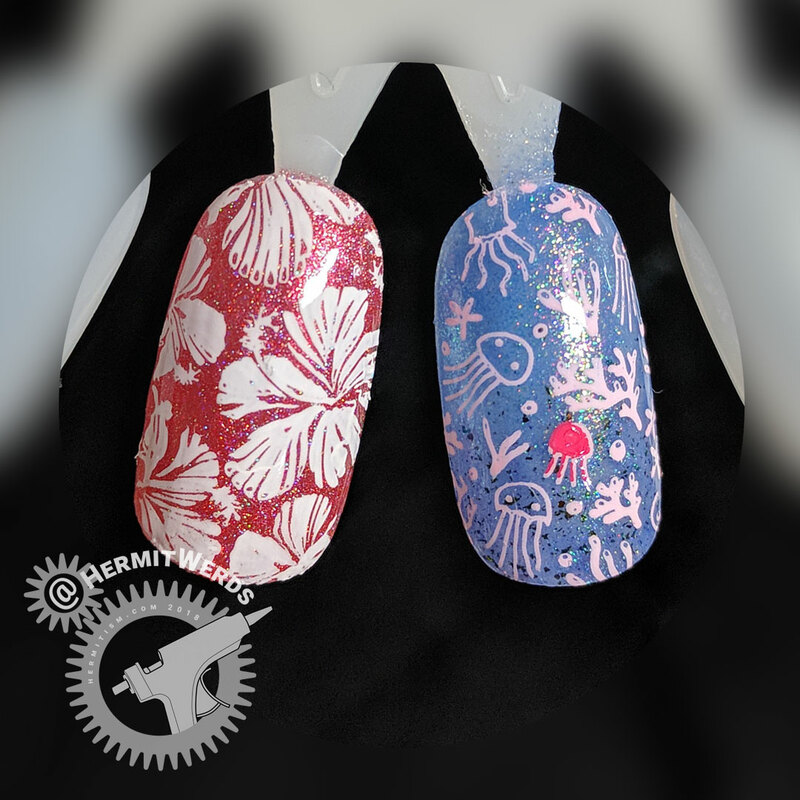 Stamping done with Mundo de Unas’ “Pastel Pink” and “Orchid”. Hibiscus Flower. Background is Colores de Carol’s “Daydream”. Stamping done with Mundo de Unas’ “White”. I’m a little sad I painted the jelly over a white base. It stole all the lovely depth a jelly polish gives a mani. 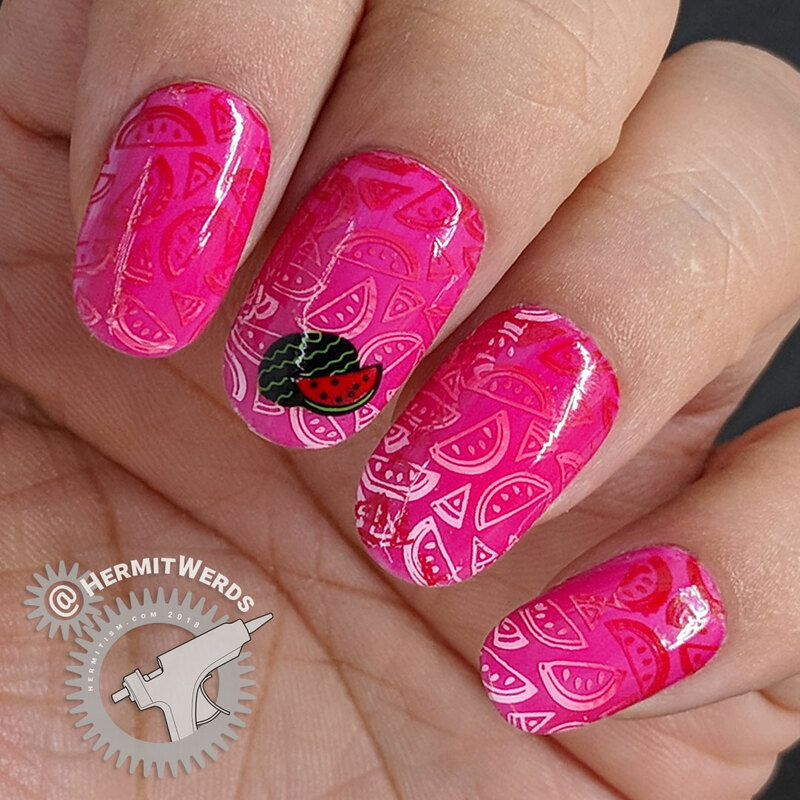 You can see how I prefer it on a watermelon mani I painted earlier this year. Frankensteined melon jelly over a white base. You can see a little of how the stamping on my thumb is a bit distorted. It would not have been as obvious on my natural nails since they are less wide. If I’d had to stretch it much more than I did, I would have changed my strategy because it would have been too distorted. 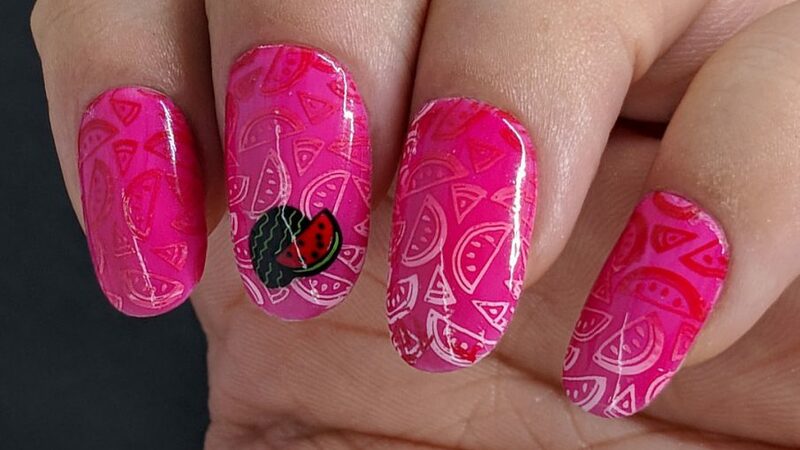 It would have taken more time, but I’d simply remove any incomplete melons and stamped the pattern on one side of the nail. Then I could have gone back and added more watermelons until the pattern looked complete. Overall, I’m really happy to have this plate in my collection. It’s very summer focused and that limits its use throughout the year, but it covers a lot of the themes that pop up all during the summer so a lot of use can be gotten out of it during those brief months.